Our Lord, God and Savior Jesus Christ is the incarnate Second Person of the Holy Trinity, the only begotten Son of God, fully God and fully man, born in time of the Virgin Mary and begotten from before all time of God the Father. Historians agree that Jesus Christ was born in Bethlehem to Mariam nine months after the Annunciation. The timing of His birth has been dated between 749 and 754 from the foundation of the city of Rome. What is known about the events of Jesus Christ's life, miracles and conversations are documented by the four books of the Gospels. The many references or titles of Jesus Christ come primarily from the Bible. "Jesus" is a transliteration, occurring in a number of languages and based on the Latin Iesus, of the Greek Ιησους (Iēsoûs), itself a Hellenisation of the Hebrew יהושע (Yehoshua) or Hebrew-Aramaic ישוע (Yeshua ), (Joshua), meaning "the Lord saves". "Christ" is His title derived from the Greek Χριστος (Christós), meaning the "Anointed One", a translation of the Hebrew-derived Mashiach ("Messiah"). "In the beginning was the Word, and the Word was with God, and the Word was God. The same was in the beginning with God. No man hath seen God at any time; the only begotten Son, who is in the bosom of the Father, He hath declared Him"
As the 'uncaused' hypostasis [person], the Father was nonetheless always with his divine Word and Spirit, who themselves were also concrete and distinct modes of existence within the divine essence. Being Father necessarily implied a schesis with his Son and Spirit, without whom, fatherhood would be logically inconceivable. That is to say, the Father could never be perceived to be alone in his divinity as this would imply that He was not always 'father' but became so, which would be unacceptable in the Eastern Orthodox tradition. And so, there was never a time when God was without his Word and Spirit. Indeed, St Irenaeus (130-202AD) had noted that when God acts in the world, He always does so through his Word and Spirit, which he called the "two hands of God." Accordingly, the teaching of the Church on the Son of God is that He was begotten of the Father before all ages, and not created in time like all other created beings of the world. Being begotten of the Father [tovn ejk tou' Patrov" gennhqevnta prov pavntwn tw'n aijwvnwn] – as is said in the Nicene-Constantinopolitan Creed – simply meant that the Son of God shared the same essence as God the Father and so was 'light from light, true God from true God.' And this eternal Son of God they identified with Jesus, whom they taught was God incarnate and born of the Virgin Mary. In countering the Arian controversy in the fourth century, which claimed that the Son of God was a creature – even though a most exalted one - born in time, the fathers of the Church taught that Jesus, as the Son of God was consubstantial [of one essence] with the Father [oJmoouvsion tw'/ Patriv]. In teaching that the Son of God was consubstantial with the Father, the Church not only refuted the famous Arian slogan which stated that “there was a time when He [i.e., the Son of God] was not”, but also made plain that that the 'being' [oujsiva] of the Son in relation to his Father was identical, one and the same; and hence entirely 'other' from that of the world's nature. On the contrary, the Son’s 'being', the fathers taught, belonged to the same substance or essence of God, whereas that of the world's belonged to the will of God and was created. As the eternal Son of God, Jesus Christ was divine with exactly the same divinity as God the Father, but, as One born on earth from the virgin Mary in Bethlehem, he was also fully human. Being of the same substance with the Father, God's only begotten Son, the man Jesus of Nazareth not only revealed the Father – "I am the way, and the truth, and the life. No one comes to the Father except through me" (Jn 14:6) – but was also the saviour of the world. Being fully human, Jesus Christ identified totally with the human condition – except for sin of course – and therefore raised it back to God, uniting it with God. And so, the Church teaches that in the theanthropic person of Jesus Christ, the faithful of the Church not only 'behold' and 'see' God but are also saved by him as well. Jesus Christ is the Messiah prophesied by the Jewish prophets of the Old Testament Scriptures. The Gospel of Matthew in particular focuses on the Jesus' fulfilment of prophecy, mainly because it was written for a Jewish audience. Emmanuel (Gr. Εμμανουηλ ) is the descriptive name applied to Our Lord and Savior and means "God with us." Between 325 and 681, Christians theologically articulated their view of the nature of Jesus Christ by a series of seven Ecumenical Councils. These councils described Christ as one person with a fully human and a fully divine nature, a doctrine known as the Hypostatic Union and defined at the Council of Chalcedon. The Christological terminology defined at the Council of Chalcedon is the main difference and the reason for the split between the Eastern Orthodox church and the Oriental Orthodox church, who only recognise the first three ecumenical councils. At the first Council of Nicaea (325), Jesus Christ was declared as God, "consubstantial" with the Father. 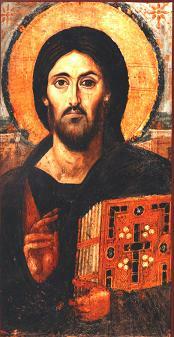 At the Council of Ephesus (431), Jesus Christ was declared as only one person, though divine as well as human. At the Council of Chalcedon, almost twenty years after Ephesus, Jesus Christ was declared to be two complete natures, one human and one divine. ↑ The Nativity of Christ is celebrated by the Eastern Orthodox church December 25 (New Calendar) and January 7 (Old Calendar). ↑ Mariam, the Virgin Theotokos, was the daughter of Joachim and Anna, who were descendants of King David. ↑ The accepted chronology AD (Anno Domini) begins from the year 754, from the foundation of Rome. ↑ The four Evangelists Matthew, Mark, Luke and John. ↑ A Messiah is a king anointed at God's direction or with God's approval. ↑ Extract from "The Mystery of the Holy Trinity" written by Mr. Mr. Philip Kariatlis, Academic Secretary and Associate Lecturer, St Andrew's Greek Orthodox Theological College. ↑ "God with us" is derived from the Immanuel (Hebrew עִמָּנוּאֵל) which is from the Hebrew Text of the Old Testament that consists of two Hebrew words: אל (El, meaning God) and עמנו (Imanu, meaning with us). This page was last edited on January 3, 2015, at 06:54. This page has been accessed 208,272 times.